Life costs money — a lot of money. But as savvy personal-finance gurus, we've learned how to cut back where we can. Consider this list of everyday things you shouldn't be paying for, and then let me know some of the basic freebies you live by in the comments below. Happy saving! Unless one of your neighbors is technologically inept and has left their Wi-Fi network unlocked, you probably have to pay for your own Internet connection at home. Okay — par for the course. But if you're paying for Wi-Fi outside of your home, you're giving into a system that takes advantage of impulse buyers. Plenty of places offer free Wi-Fi these days (Starbucks, Panera Bread, and even many McDonald's) as an incentive to come in and sit for a while. But then there are times when you really want to connect, and the only option is a paid connection (airplanes, anyone?). Don't fall for it. Load your devices up with everything you need to relax or read beforehand (like books, documents, movies, and TV shows), so you don't have to pay to get online. One day, in a perfect America, we'll never have to pay for public Wi-Fi. Consider your refusal to do so today a stand for the future. How much ketchup, mustard, and mayo do you use? I use very little, so the packets that I can harvest from my occasional take-outs and order-ins suit me just fine for when I need them at home. Even more expensive commodities like sugar, jams, and honey can be found if you're looking hard enough — like those packets and individual jars that are common at the resorts and hotels that you may visit on vacation. Free napkins are virtually everywhere you go, from rest stops to fast-food joints to the bars at your local restaurants. They're at your place of employment, the doctor's office, and even at your local theater. Pick up a few every time you go out and you'll never need to buy another napkin again. One of the most brilliant capitalism coups of the 20th century was convincing people to pay for water in bottles. Um, hello — we live in America, where we have some of the cleanest, tastiest water on the planet (which our taxes cover, by the way). Fill up a reusable bottle already. It's 2016, my friend. One, you shouldn't have a checking account that's charging you a monthly maintenance fee. If you're banking at an institution that's siphoning money from your account just for being part of its brand, change banks — stat! Also, stop visiting ATMs that charge fees. I've gone to ATMs whose fees were upwards of $5 before, and that's just not acceptable. If you know you'll need cash on a night out, take out how much you think you'll need. You're already paying inflated prices for drinks — do you really need to pay $5–$10 extra in bank fees when all is said and done? Nobody — and I do mean nobody — needs to pay for a gym membership. Exercise is free if you want it to be. There are plenty of workout and fitness videos available for free on YouTube and other resources to help folks who are pinching their pennies lose weight and get in shape. Mobile phone companies are fighting so hard for your business these days that they're offering free phones to switch carriers, sign new two-year contracts early, and other incentives. Listen to me: You do not need to the latest and greatest phone as soon as it hits the market. Cool your jets, wait a bit, and upgrade when it's available to your for free as a result of your continued business with your carrier — or one to which you switch. They need you, not the other way around. Every one of us is entitled to a free annual credit report by decree of the federal government. Never, ever pay for one. The credit report you get in January should be accepted by anyone who needs to see it until at least a year later. Google Drive, with all its components, pretty much replaces any need for the Microsoft suite of office software. If you can't afford Microsoft or other programs — and they're fairly pricey if you have to buy them yourself — there's no need to fret. Online resources have your back. It's frozen water, ma'am and sir. Even though we weren't born magicians, we're all capable of turning water into ice, at home, for free. Stop buying it! It's everywhere, and, frankly, print media can't keep up with the immediateness of the Internet and social media. If you're connected, there's no point in buying anything in print anymore. Unless your taxes are complicated — like, say, if you own a business, and you require an accountant — there are resources online that allow you to do your taxes efficiently and effectively, which, in turn, results in a quicker payday than if someone else were on the case for you. Nearly every show you watch is available either for free online by its respective network or a streaming service that charges far less than the monthly cable bill you're paying. One word: Skype. Or, okay, two words: FaceTime. Either way, long-distance phone calls should be dead to you by now. Almost every museum offers at least one day a month where admission is free. Even better, some museums are part of programs — like Bank of America's Museums on Us — where entire weekends are free. Before you fork over the cash to view and enjoy what, frankly, should belong to the American people and not private entities (especially those getting tax breaks for being "not-for-profit" organizations — but I digress), research the museum you'd like to visit and see how you can get in without paying a dime. 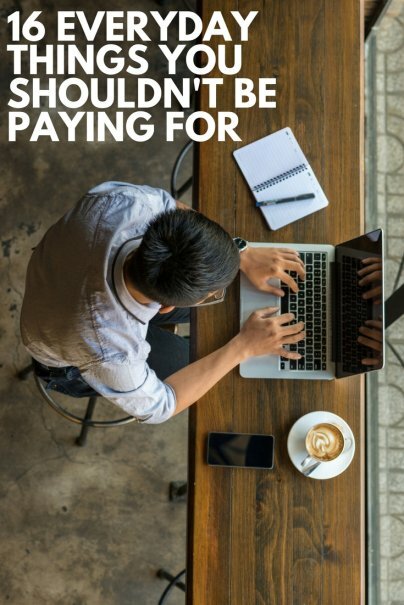 What are some other everyday things you shouldn't be paying for? Let me know in the comments below. I seem to remember this from a couple of years ago. I agree, but it is also stealing. I would argue that the gym membership is not a waste of money for some people (the kind who actually use it). If you're the type to use the different types of cardio machines and the free weights or the pool, then it's a worthwhile expense. Most have neither the money nor the space to equip their living spaces with the wide variety of equipment the gym offers. If you actually use it regularly and vary your routine, it's a wise investment in your health. The condiment suggestion might work for an adult-only household that rarely uses them, but would never work in my house with younger kids who LOVE their condiments. Maybe instead of worrying about the money spent on a $2 bottle of ketchup, folks should frequent these places less and spend less eating out. All great suggestions! But don't forget that free WiFi connection can be had at your public library too. Many libraries also offer museum passes that will get you in at a discounted price if not for free. Never underestimate the value of your library card!! But condiments and napkins are for the people EATING in the restaurant! I think health insurance should be free..the costs are ridiculously high. And they ( the insurance company) have the option of denying the treatment your Dr says you NEED! Too much bureaucracy on the side off and in advantage of the government and insurance companies... And really NO HELP to citizens who cant aggord it. Unfortunately, as a lender i can say a credit report is not good for a year. Possibly for a pre-qualification, but to obtain a loan, mortgage, lease etc regulations require ut to be done upon appication and prior to closing if the dates are more than 30 days apart. For rental agreements the standard is 90 days max, however i also have rentals and i would never accept someone handing me a copy of their own credit report, especially if it was more than 30 days old. This is the case where you will have to pay for it. Large lenders may not charge, but landlords always do. Otherwise, many valid points. Im not one to ever really focus much on money saving, but perhaps i will give some of these a try. Taking extra condiments, napkins, etc equates with stealing to my mind. If your water is horrible tasting, (like ours is), sometimes setting it out in an open jug for a day dissipates the chlorine flavor. Since ours also has a ton of minerals and messes with our teapot, we've taken to a pitcher filtration system. No longer "free" water. An alternative to paper napkins is cloth. They can be made at home simply, and thrown into your regular wash load. Some live shows allow you to usher instead of paying for tickets. My dancer roomies used to do that often. Nike offers free workout classes and run clubs at a lot of their stores. And if you don't live near a Nike store that does, they also have a free app called Nike Training Club with 100+ workouts. Lifesaver.